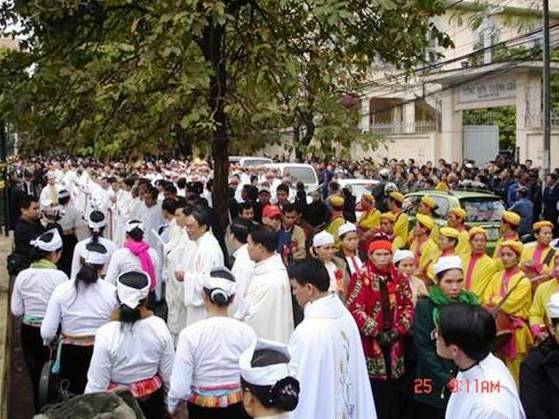 Hanoi, Feb. 1, 2008 (CWNews.com) – Vietnamese government officials have tentatively agreed to return the former offices of the apostolic nuncio in Hanoi to the Catholic Church. In a stunning victory for Catholic activists who had been organizing daily prayer vigils outside the former nunciature in Hanoi, pleading for return of the building that had been confiscated by the Communist leadership in 1959, the government has agreed to turn the building over to Church leaders. The concession by the Vietnamese government came just hours after the publication of a letter from Cardinal Tarcisio Bertone (bio – news), the Vatican Secretary of State, urging Hanoi's Catholics to avoid confrontation with police. Informed sources in Hanoi said that the government had agreed to allow the Catholic archdiocese to resume use of the building, in exchange for a promise that the daily prayer vigils would stop. For the whole story, click here. For news leading up to this victory won by courageous Catholics in the face of danger, read the story here in AsiaNews. Was the Early Church Catholic? Steve's show on Relevant Radio's "Searching the Word" — click here to listen.